Walter Greaves, painter and etcher of river scenes, landscapes, and portraits. Greaves was born in Cheyne Walk, Chelsea. He was the son of a London boat builder and waterman who used to ferry J. M. W. Turner across the Thames. Like his father, Walter and his brother Henry, became watermen. In the early 1860s Walter and his brother Henry met and befriended the artist James McNeill Whistler, who was a neighbour. They began to work as watermen for Whistler on the river. 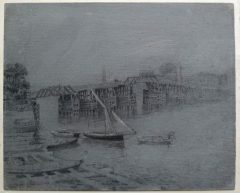 It was during this time that Whistler was working on his Thames Set Series. By the mid 1860’s Walter & Henry Greaves became his unpaid pupils and studio assistants. Walter began to attend drawing classes and began drawing and printmaking himself. By the 1870’s, Whistler, due to his success, began to expand his friendships in the art world, excluding the Greaves from this distinguished circle. Consequently, Greaves suffered years of neglect, misfortune and poverty before his discovery by William Marchant, the proprietor of the Goupil Galleries. Greaves’s had his first exhibition in 1911 at the Goupil Gallery in London, the show was a big success. Greaves had another exhibition at the Grosvenor Gallery in 1922 which was organised by Augustus John, William Nicholson and William Rothenstein. He was elected as an honorary member of the Chelsea Arts Club. Despite the support of a few fellow painters, including Sickert, Greaves again fell into obscurity and spent his last eight years as a Poor Brother of the London Charterhouse. Greaves died, unmarried, of pneumonia in the West London Hospital, Hammersmith and buried in the Charterhouse graveyard in Essex. The Tate Gallery and Victorian and Albert Museum hold examples of his work. The William Darby (Darby & Browse) held an exhibition of his work in 1972; Parkin Gallery held two exhibitions in 1980 and 1984.